It will take place 18th to 22nd April 2018, the expected annual edition of Bloemencorso Bollenstreek and that will have as its central theme the"Culture".The parade follows the "pattern" of the past years with the first three days dedicated to the contruction days in Sassenheim, where the wagons will move on the afternoon of 20 for a parade between the lights of Noordwijkerhout. The next day the expected flower parade between Noordwijk and Haarlem and arrival in the evening in the square where, on the 22nd, the wagons will remain for the final day. 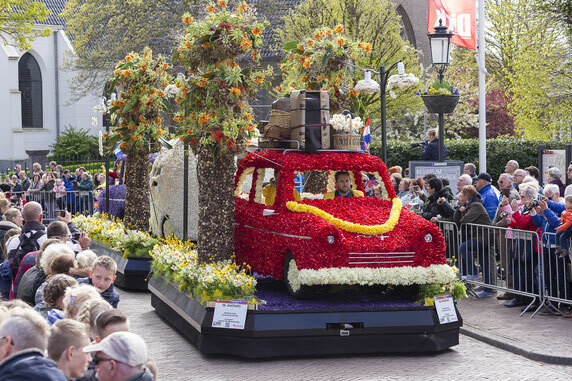 The Bloemencorso is the largest parade made with spring bulb flowers like hyacinths, tulips and daffodils and for that collects not only a large number of active participants, but also a large crowd from all over the world, curious to admire the floral creations. The first floral parade of the bulb region dates back to 1947 and was Willem Warmenhoven, an amarillys grower from Hillegom, who created the first whale-wrapped carriage. Built on a dump truck and covered with hyacinths, though very simple, it started to desire to develop and expand the parade. Hillegom invited Sassenheim and Lisse to collaborate with them for a large parade, and with time they created a small parade committee. Since then, the parade of the bulb region, the Bloemencorso the Bollenstreek, is making history every year. 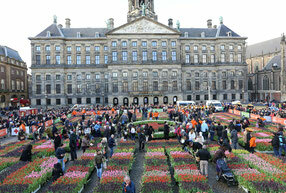 In fact, the spring flower parade has become an internationally renowned phenomenon. The three days before the parade of April 21st, will be dedicated to the very important work of building and creating wagons. Those who want to attend this event can go to the DeLeeuw Flowerbulbs Hall in Sassenheim.Various local music bands will perform to entertain the public and support volunteers in the hard work of building wagons.Inside the room there is a bar where you can take a coffee, a tea or something to eat. The constructions days will take place at the DeLeeuw Flowerbulbs hall on Rijksstraatweg 52, 2171 AM Sassenheim (exit 4 A44). 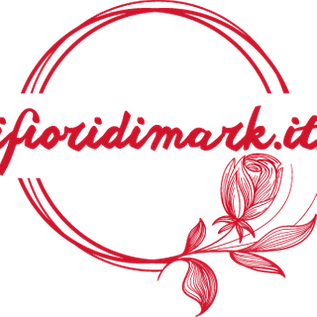 Wednesday, April 18th, 2018 from 9.00 to 22.00. Thursday April 19th 2018 from 9am to 10pm. The entrance fee includes a cup of coffee or tea. 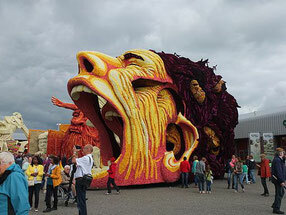 As already mentioned earlier, after the first days of contruction days, Bloemencorso will enter Noordwijkerhout with a pass from 9.15 pm to 10.00 pm. On the 21st, however, will be the day of the actual parade with departure from Noordwijk around 9.30 am in direction Voorhout where the wagons will pass around 11.20 am. 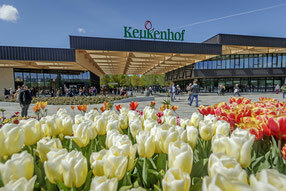 At 12.25 the parade will arrive in Sassenheim, from where it will start around 2.00 pm in the direction of Lisse, where it will "approach" at 2.45 pm to visit the Keukenhof park at around 3.40 pm. Hillegom at 16.20, then Bonnebroek where Bloemencorso will arrive at 6.00 pm and resume at 7.40 pm ; Heemstede at about 8.00 pm and finally the long-awaited arrival at Haarlem at 8.45 pm and the final entrance at Gedempte Oude Gracht at 9.30 pm where on April 22nd the wagons will remain available to the Bloemencorso judges.